DELTA is composed of four functional units that include Finance and Business, Online and Distance Education, Academic Technology Innovation and Marketing and Partnership Development. To contact a particular unit, find their information at Contact DELTA. To see a detailed outline of DELTA’s structure, view the DELTA Organizational Chart. Our Finance and Business office provides compliant management of personnel, budgetary and accounting functions and coordinates the allocation of funds within DELTA and the allocation of online and distance education funds to colleges and departments throughout the university. Our Online and Distance Education unit provides leadership for NC State’s online and distance education programs, supporting a wide variety of courses, degrees, certificates and licensure programs to meet the educational needs of students wherever they are located. The Online and Distance Education website includes listings of programs and courses offered. Services and support include program planning and development, enrollment planning, compliance with regulatory and accreditation standards, course scheduling, faculty support services, and student support including advising, enrollment and registration services, a virtual orientation, and local and remote testing services. Our Academic Technology Innovation (ATI) unit maintains a robust and reliable academic technology infrastructure for both online and blended teaching and learning at NC State, including enterprise, customized deployments of synchronous and asynchronous learning management systems, enterprise lecture-capture technologies, and in-house developed instructional tools and interactive media that address specific teaching and learning needs. 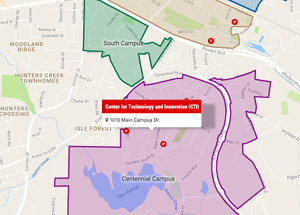 ATI offers professional development opportunities and pedagogical assistance focused on teaching and learning with technology and learning technology support for NC State faculty and staff. ATI also provides web and video-based production assistance for the development of online and distance education and web-enhanced courses, video-based classroom services, and design leadership, project coordination, communication and brand management across multifaceted DELTA initiatives. The DELTA Marketing and Partnership Development (MPD) unit designs and implements strategic distance education marketing initiatives, conducts market research and builds collaboration among all colleges and units on campus, as well as with other University of North Carolina system institutions and other key partners. By using sophisticated search engine optimization (SEO) techniques and marketing strategies, MPD has achieved top program visibility without costly pay-per-click, cost-per-click or cost-per-impressions advertising. The combination of marketing and partnership development has helped build awareness, both internally as well as externally, that NC State’s online distance education and learning technologies are among the top tier programs in the world.